Would you like Julia Ward Howe at your Stand for Peace event? Try here to find moderately priced Victorian costume pieces to purchase for your re-enactor. We have created a flyer/poster for you to use to market your Stand for Peace. Just fill in the location, sponsor and contact and you are all set to post these! Please click on the icon below. We found that printing out small business sized cards with our event details on the back make a great way to promote our event. Take them to local events, church meetings, hand them out to friends. Folks are happy to tuck something small into their pocket or wallet. We have a PDF here for you to use to create a sheet of cards. Print out a full sheet and be sure to add your event details to the back of the card. Please click on the icon below. Use these signs at your Stand for Peace event. Or come up with your own! Signs are available below is two different sizes. Please print them out (card stock helps!) and bring them to the event! Need buttons? T shirts? Hoodies? Baby onesies? Bags? 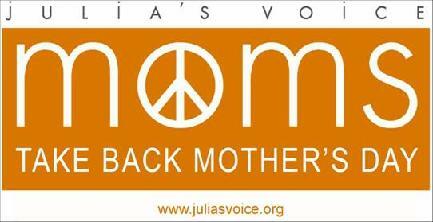 Visit our Julia's Voice Store at Cafe Press. Flyers: Stand for Peace flyers for you to post to advertise your OWN event. And some for our Kansas City event. Signs: Here is a sign for you to print out to bring to your Stand for Peace event. It is sized at 81/2 X 11. Print this double sided sign to bring to the event!